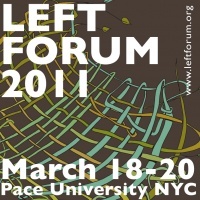 Left Forum 2011 took place March 18 - 20 at Pace University, New York City. The theme for the conference is "Towards a Politics of Solidarity". Losang Rabgey Machik, A Tibetan NGO based in Washington D.C.
Sharif Abdel Kouddous, Democracy Now! Professor Anthony Monteiro, Temple University Philadelphia, Penn. Timothy Hall, University of East London, U.K.
Julie Hollar, Fairness & Accuracy In Reporting; Extra! Danny Schechter, Founder of MediaChannel, Founder and Exec. VP of Globalvision, Inc. This page was last modified on 8 December 2018, at 18:23.